It is said that Dreyer himself thought that the movie was a failure, because he relied too much on atmosphere, rather than personalities (all his great movies are character dramas). It is true that there is little psychological insight in this charming little fairytale. But whosoever enquired about the dimensionality of the pied piper of Hamelin? Some may say that Der van Engang is wanting of gravitas, I on the other hand delight in its frivolity. The film is a succession of painterly images. The DVD is the only one I have ever bothered to take screen-captures from. The costume design is exquisite, much less gaudy than in modern period dramas. My favourite reel is of the princess and her ladies in their chamber listening to the waterborne minstrel of the prince of Denmark. Their longing is palpable, their desire clear for all to see. I can't tell you how fond I am of playing this part frame by frame. The rapt princess on her divan, a swooning lady by the window and the most adventurous daring to set eyes on the lute player and the minstrel. The yearning for adventure, romance and foreign lands, denied these beauties in their dovecote, is quite powerful. This is a fairytale for adults. 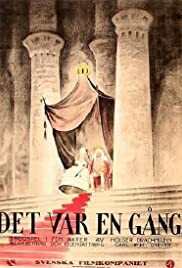 There is much escapism to be had: some of the slapstick antics of the hero's squire, Kasper Røghat, are truly amusing (including a couple of laugh-out-loud moments). However it is the atmosphere of impeccable sensuality that pleases me the most. It is true that the taming-of-the-shrew theme of the plot gradually becomes a bit tedious. It is also a problem that the movie peters out, mostly this is because of the fragmentation towards the end due to missing reels. However Der van Engang is still very much required viewing. Not necessarily a film to recommend to fans of other Dreyer movies, it stands very much alone. Because of its sheer unadulterated innocence, if for no other reason, I suggest you watch this movie. The DVD of this movie is available from the Danish Film Institute. If you've seen this movie and liked it I recommend Sir Arne's Treasure by Mauritz Stiller which has recently got a DVD release.